We didn't get a Christmas tree this year. The kids weren't interested, apparently having entered a post-materialist world where the smartphone cornucopia renders most other possessions unnecessary. To fill the void where a Christmas tree once stood, I'm imagining evergreen trees in a forest high in the mountains of Mexico, densely decorated not with lights and tinsel but with monarch butterflies. 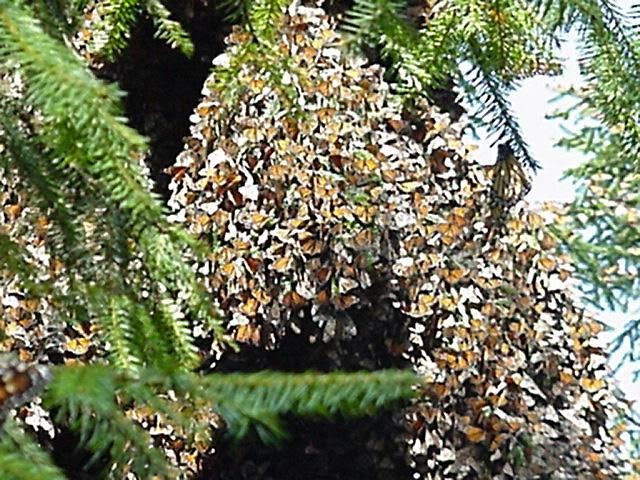 Not until this month did word arrive that the monarchs had finally made it safely to their mountain forests of Mexico. November 26, more than three weeks later than usual, the main population showed up, larger than last year's record low, but still with a long way to go to recover. Among them may be the few scattered monarchs seen in Princeton in late summer. May they have a safe overwintering, and much milkweed in the new year. Addendum, Dec. 30: We may have a concept here, that each gardener, by planting milkweed, and each farmer, by allowing milkweed to grow, might contribute to the decorating of oyamel fir trees in that small mountainous area where monarchs congregate each winter. What other species engages so broadly with a continent, then congregates in such ornamental fashion to make its status known each winter? Heavy rains followed by a hard frost December 7 made the garden path crunchy underfoot. A closer look revealed miniature pillars of ice with pebbles on top. Water flows up from the soil via capillary action, with the upward motion continuing above ground as a column of ice fed from below. Needle ice is a surface form of the frost heaving that can loosen soil, slowly lift rocks towards the surface, and work mischief on asphalt. The capillary action that allows water to move upwards in the soil is counterintuitive, and helps explain how trees completely surrounded by asphalt and concrete can still get water. Here's a little story that shows how the past can enrich the present and inform the future. Two years ago, I was over at the Princeton Battlefield, in that immense mowed field on the north side of Mercer Road (the side with the columns), and noticed a pattern in the wooded edges of the field. It's most obvious during April, when these flowering dogwoods advertise their position, but you can see it as well in the autumn when their leaves turn radiant colors. The dogwoods are spaced all around the edge of the field, but on the left side they've been completely overgrown by vines. It's a matter of time before the shade and weight of the vines weaken and ultimately kill the trees. Hopefully, a workday to cut the vines can be arranged soon with the Friends of Princeton Battlefield. Recent Veblen-related research of old newspapers has solved the riddle of who planted the trees and when, and may provide further impetus for action to save the beautiful trees. Turns out the trees were donated back in 1976 by the Dogwood Garden Club, which still exists. Among its current projects is care of one of the gardens near the Princeton swimming pool entry. The relevant text from the article is in bold. The annual Christmas Auction and Bake Sale of the Dogwood Garden Club will be 5 held Thursday, December 9. 1 in the home of Mrs Michael ; Jensen, 18 Riverside Drive ' West Co-hostesses will be Mrs William Alston, Mrs. Joseph Pierson, Mrs. Richard Olsson and Mrs. Frederick Wightman Jr. Mrs. Dudley Clark will serve as auctioneer. All articles to be auctioned have been made by the members and all proceeds will be used in cooperation with the Mercer County Park Commission to continue the restoration and maintenance of the memorial garden around the home of Mrs. Oswald Veblen in Herrontown Woods. In honor of the Bicentennial the club recently gave 25 dogwood trees to the Princeton Battlefield Preservation Society to be planted on the grounds. I was invited by my daughter's 9th grade biology teacher, Alexis Custer, and her colleague Jayne Ricciardi, to come in and speak to four classes over the course of a day at Princeton High School. The subject, invasive species, is full of subtleties and contradictions. Plants are good. They're the producers, ecologically speaking, while we're among the consumers. And yet, some of the thousands of imported plant and animal species are wreaking ecological havoc. Though our culture tends to associate destructive consequence with ill-intent, most or all of the destructive consequence of invasive species was unintended. For example, the burmese pythons now altering the ecology of the Everglades were introduced by pet owners who released their exotic snakes into the wild when they got too big to keep at home. The collective consequence of seemingly humane individual acts can undermine a whole ecosystem. Adding to the irony, an overabundance of one of the most beautiful and iconic native creatures of our woods, the white-tailed deer, is magnifying the damage by eating primarily native species, giving the invasives a big competitive advantage. A more positive side of the story is that people can have a positive, healing effect on nearby ecosystems, by restoring balance. Most satisfying was telling the students about the high school's wonderful ecolab wetland, which is fed by an "old faithful" sump pump that keeps the wetland wet year-round with groundwater steadily being pumped out of the school's basement, several stories below their classroom. It's a great example of how people can create rich, productive habitats for plants and wildlife by working with nature, rather than against it. The kids were attentive through the 45 minute talks. School curriculums, when they teach ecology, often focus on distant ecosystems like the Amazon or the arctic. This was a great opportunity to introduce the students to the ongoing ecological drama waiting to be explored in the town where they live. I hope they get out and walk the trails leading through Princeton's many nature preserves. And what a sweet thank you note came in the mail from all the kids! The parking lot was packed for our Thanksgiving weekend walk in Herrontown Woods. Forty people, all told, most of whom stayed for the full two hour venture up and over the Princeton ridge and back again. I explained that the preserve had, as in a fairy tale, gone into a deep slumber over the years. The trails had become overgrown with thorny multiflora rose, and blocked by fallen trees. The house and cottage were boarded up. Landmarks like the cliff had become obscured and forgotten. Then two years ago, what came to be known as the Friends of Herrontown Woods set about clearing the trails and making the preserve welcoming again. Neighbor Ed Simon, who leads stewardship efforts at nearby Gulick Park, added some context, describing how a corridor of preserved open space in northeastern Princeton extends from Bunn Drive eastward through Herrontown Woods, with Smoyer Park nearby and Gulick Park beyond that. An overarching vision would be to develop synergy and connectivity between all of these elements, which include nature trails, history, the active rec of Smoyer Park, and remnant farm elements. One of my favorite parts of the walk came early on, when I mis-spoke. Our first stop along the trails was at a solitary hazelnut shrub growing beneath a grove of trees with dark, chunky bark. As I was telling everyone about these trees, which I identified as tupelos (black gum), I gazed up into their canopies far above and noticed what looked like fruits on the twigs. Tupelos would not have that sort of thing. What I was seeing was beginning to contradict the words I was saying. Then one of the participants presented me with the fruits of persimmon that she'd found on the ground. Hmmm, there must be a persimmon tree around somewhere. Then I realized. The trees we were looking at were persimmons, not black gums. Though possibly wild, this dense grove of persimmon trees could also have been planted long ago as part of the farm. Impressively, they had grown fast enough to keep up with the forest rising around them after the farm was abandoned. Second stop was the Veblen cottage, then a side trip to the Veblen House, where I got to tell a bit of the history of the Veblens and the first owners of the house, the Whiton-Stuarts. Then a hike up the slope of the ridge to the cliff, where everyone enjoyed the view from the thirty foot dropoff. That's Sally Curtis holding the camera. From the cliff, we crossed the pipeline right-of-way and entered the beech forest, which looked like a wonderland with the tawny beech leaves still attached to the trees. Not far in, we hung a right, heading off trail to the north, where a mysterious expanse of water was recently discovered by some of us in the Friends of Herrontown Woods. Here, in this flat pancake of land at the top of the ridge, which serves as a giant sponge that captures rainwater then slowly feeds it to the tributary of Harry's Brook that flows down through Herrontown Woods, a bulldozer long ago dug an L-shaped pool. A lively discussion ensued about its original purpose. Had they used the bulldozer to push up rocks for use somewhere else in Princeton? Seemed to me there were plenty of boulders available on the surface of the ground, with no need to dig. I used a stick to push down through the muck to solid bottom. Three feet deep. For now, I'm sticking with the swimming pool theory, but it would make a great skating rink if we get a cold spell. We then headed back to the trail, past the boulder field, and down along the creek whose broad, flat headwaters we had just visited. What a treat to lead such a walk, and introduce or reintroduce so many people to this reawakened preserve. "We're been waiting for news that the mass arrival has occurred--and just received word yesterday (that it happened the day before). We will be updating the sites soon-- maybe before Monday." Great, the monarchs arrived, though nearly four weeks later than usual, and I'll feel better when their website is actually updated. Another communication received, far less friendly, was an anonymous comment concerning the use of the herbicide glyphosate in habitat restoration. Part of the fallout from the massive use of glyphosate on genetically modified "Roundup-Ready" crops has been the demonization of glyphosate and everyone who uses it. The targets of criticism, in some people's minds, should include not only Monsanto and farmers, but also managers of nature preserves who may put a dab of glyphosate on the stumps of invasive shrubs so they don't grow back. Sure, I wrote, in what I thought to be a fairly insightful post, lets rail against the massive use of glyphosate on more than 100 million acres of farmland that once offered monarchs enough scattered milkweeds to prosper. But it's the massive use, not the chemical itself, that is the problem. Antibiotics provide an analogous situation. Their power can be wisely used in medicine, or abused when indiscriminately given to animals in their feed. It would be unfair to vilify a doctor's careful prescribing of antibiotics because of industrial agriculture's wild excess. And the vilification of preserve managers, who use micro amounts of highly targeted herbicides in their work, is similarly unfair. Personally, I haven't used herbicides of any kind in years, but any serious attempt to restore balance to a forest, to take on a monstrous, smothering stand of wisteria or thousands of winged euonymus and honeysuckle choking a hillside, will necessarily require some use of herbicide, well-timed and minimally applied. If the anonymous commenter or anyone else would like to send an email, with name attached, I'd be glad to correspond on this subject. Maybe we can learn something from each other. In the meantime, a hope that the monarchs did in fact arrive and will be safe through the winter.